After spending months searching for a decent track system, we gave up and decided to make our own. 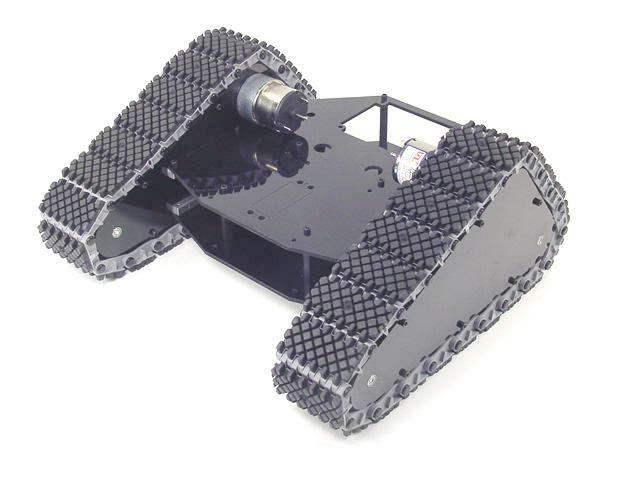 These polypropylene / rubber tracks are perfect for your small robot project. They are rugged, lightweight, reliable. These tracks will not slip from the sprockets. They are extremely smooth and quiet and have very little friction. There are a variety of sprockets available, with a selection of different hubs. Rubber has a Shore A hardness of 45. Pitch is 1.07", and width is 2". Pitch is 1.07", and width is 3". Includes our Universal 6mm Hub (HUB-02). Sprocket diameter with tracks is ~4.5"
Pitch diameter (calculated, not measured) 2.14"
Large Hub sold separately - several options. Sprocket diameter with tracks is ~5.75"
Sprocket diameter with tracks is 7"
Works with our Universal 6mm Hub (HUB-02) and 4mm Hub (HUB-03). Sprocket diameter with tracks is 3.75"
Sprocket diameter with tracks is 2.75"
These passive idler hubs fit our 2" tracks, and can be used with either the 6 or 9 link sprockets. They are designed to fit perfectly between two panels separated by 1.5" standoffs (AHS-04). These passive idler hubs fit our 3" tracks, and can be used with either the 6 or 9 link sprockets. They are designed to fit perfectly between two panels separated by 2.5" standoffs. Works with any motor with a 4mm shaft. For Green Dot Sumo (TSR-02), (TSR-03), (TSR-04), Ant/Beetle (BBT-01) tires. Works with any motor with a 6mm shaft. These useful snap rivet fasteners make mounting servos simple. The fasteners fit all size servos.